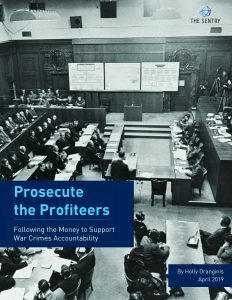 Today, Enough’s partner, The Sentry, released a new report, “Prosecute the Profiteers: Following the Money to Support War Crimes Accountability.” Authored by The Sentry’s Senior Legal Analyst, Holly Dranginis, the report highlights the pervasive role of financial actors in the perpetration of atrocities, and critical omissions in the ways those crimes are prosecuted — with the financing of violence largely left out. It proposes concrete steps to usher in new approaches and tools for justice efforts, to pay due attention to the profit motivations and financial facilitators that undergird some of the worst ongoing crises of our time. As The Sentry and others have uncovered, the conduct of business actors in the armed conflicts and kleptocracy affecting communities in DRC, South Sudan, CAR, and Sudan is central to the perpetration of large-scale theft and violence. Prosecutions should reflect that dynamic. Anti-money laundering measures and network sanctions can efficiently disrupt illicit money flows, and prosecutions could be a much more critical complement. As the new report says, “Many of the financial activities that sustain cycles of atrocities are criminal acts that elicit no criminal punishment.” An effective financial pressure strategy against repressive regimes must include war crimes prosecutions that take finance into account. Collaborate across borders and use open source intelligence gathering, especially in foreign domestic courts with jurisdiction over financial actors with a role in atrocity crimes.